When used in pregnancy during the second and third trimesters, drugs that act directly on the renin-angiotensin system can cause injury and even death to the developing fetus. When pregnancy is detected, ATACAND should be discontinued as soon as poss-ible. See WARNINGS , Fetal/Neonatal Morbidity and Mortality . ATACAND (candesartan cilexetil), a prodrug, is hydrolyzed to candesartan during absorption from the gastrointestinal tract. Candesartan is a selective AT 1 subtype angiotensin II receptor antagonist. Candesartan cilexetil, a nonpeptide, is chemically described as (±)-1-Hydroxyethyl 2-ethoxy-1- [ p -(o-1 H -tetrazol-5-ylphenyl)benzyl]-7-benzimidazolecarboxylate, cyclohexyl carbonate (ester). Pediatric-- The pharmacokinetics of candesartan cilexetil have not been investigated in patients <18 years of age. Geriatric and Gender-- The pharmacokinetics of candesartan have been studied in the elderly (>/=65 years) and in both sexes. The plasma concentration of candesartan was higher in the elderly (C max was approximately 50% higher, and AUC was approximately 80% higher) compared to younger subjects administered the same dose. The pharmacokinetics of candesartan were linear in the elderly, and candesartan and its inactive metabolite did not accumulate in the serum of these subjects upon repeated, once-daily administration. No initial dosage adjustment is necessary. (See DOSAGE AND ADMINISTRATION .) There is no difference in the pharmacokinetics of candesartan between male and female subjects. In heart failure patients with renal impairment, AUC 0-72h was 36% and 65% higher in mild and moderate renal impairment, respectively. C max was 15% and 55% higher in mild and moderate renal impairment, respectively. See PRECAUTIONS , Drug Interactions . In multiple-dose studies with hypertensive patients, there were no clinically significant changes in metabolic function, including serum levels of total cholesterol, triglycerides, glucose, or uric acid. In a 12-week study of 161 patients with non-insulin-dependent (type 2) diabetes mellitus and hypertension, there was no change in the level of HbA 1c . In heart failure patients, candesartan >/=8 mg resulted in decreases in systemic vascular resistance and pulmonary capillary wedge pressure. The antihypertensive effects of ATACAND were examined in 14 placebo-controlled trials of 4- to 12-weeks duration, primarily at daily doses of 2 to 32 mg per day in patients with baseline diastolic blood pressures of 95 to 114 mm Hg. Most of the trials were of candesartan cilexetil as a single agent, but it was also studied as add-on to hydrochlorothiazide and amlodipine. These studies included a total of 2350 patients randomized to one of several doses of candesartan cilexetil and 1027 to placebo. Except for a study in diabetics, all studies showed significant effects, generally dose related, of 2 to 32 mg on trough (24 hour) systolic and diastolic pressures compared to placebo, with doses of 8 to 32 mg giving effects of about 8-12/4-8 mm Hg. There were no exaggerated first-dose effects in these patients. Most of the antihypertensive effect was seen within 2 weeks of initial dosing, and the full effect in 4 weeks. With once-daily dosing, blood pressure effect was maintained over 24 hours, with trough to peak ratios of blood pressure effect generally over 80%. Candesartan cilexetil had an additional blood pressure lowering effect when added to hydrochlorothiazide. Candesartan was studied in two heart failure outcome studies: 1. The Candesartan in Heart failure: Assessment of Reduction in Mortality and morbidity trial in patients intolerant of ACE inhibitors (CHARM- Alternative), 2. CHARM-Added in patients already receiving ACE inhibitors. Both studies were international double-blind, placebo-controlled trials in patients with NYHA class II - IV heart failure and LVEF </=40%. In both trials, patients were randomized to placebo or ATACAND (initially 4-8 mg once daily, titrated as tolerated to 32 mg once daily) and followed for up to 4 years. Patients with serum creatinine >/=3 mg/dL, serum potassium >/=5.5 mEq/L, symptomatic hypotension or known bilateral renal artery stenosis were excluded. The primary end point in both trials was time to either cardiovascular death or hospitalization for heart failure. CHARM-Alternative included 2028 subjects not receiving an ACE inhibitor due to intolerance. The mean age was 67 years and 32% were female, 48% were NYHA II, 49% were NYHA III, 4% were NYHA IV, and the mean ejection fraction was 30%. Sixty-two percent had a history of myocardial infarction, 50% had a history of hypertension, and 27% had diabetes. Concomitant drugs at baseline were diuretics (85%), digoxin (46%), beta-blockers (55%), and spironolactone (24%). The mean daily dose of ATACAND was approximately 23 mg and 59% of subjects on treatment received 32 mg once daily. In CHARM-Added, 2548 subjects receiving an ACE inhibitor were randomized to ATACAND or placebo. The specific ACE inhibitor and dose were at the discretion of the investigators, who were encouraged to titrate patients to doses known to be effective in clinical outcome trials, subject to patient tolerability. Forced titration to maximum tolerated doses of ACE inhibitor was not required. ATACAND is indicated for the treatment of hypertension. It may be used alone or in combination with other antihypertensive agents. ATACAND is indicated for the treatment of heart failure (NYHA class II-IV) in patients with left ventricular systolic dysfunction (ejection fraction </=40%) to reduce cardiovascular death and to reduce heart failure hospitalizations. (See Clinical Trials .) ATACAND also has an added effect on these outcomes when used with an ACE inhibitor. ATACAND is contraindicated in patients who are hypersensitive to any component of this product. Drugs that act directly on the renin-angiotensin system can cause fetal and neonatal morbidity and death when administered to pregnant women. Several dozen cases have been reported in the world literature in patients who were taking angiotensin-converting enzyme inhibitors. Post-marketing experience has identified reports of fetal and neonatal toxicity in babies born to women treated with ATACAND during pregnancy. When pregnancy is detected, ATACAND should be discontinued as soon as possible. These adverse effects do not appear to have resulted from intrauterine drug exposure that has been limited to the first trimester. Mothers whose embryos and fetuses are exposed to an angiotensin II receptor antagonist only during the first trimester should be so informed. Nonetheless, when patients become pregnant, physicians should have the patient discontinue the use of ATACAND as soon as possible. Rarely (probably less often than once in every thousand pregnancies), no alternative to a drug acting on the renin-angiotensin system will be found. In these rare cases, the mothers should be apprised of the potential hazards to their fetuses, and serial ultrasound examinations should be performed to assess the intra-amniotic environment. If oligohydramnios is observed, ATACAND should be discontinued unless it is considered life saving for the mother. Contraction stress testing (CST), a nonstress test (NST), or biophysical profiling (BPP) may be appropriate, depending upon the week of pregnancy. Patients and physicians should be aware, however, that oligohydramnios may not appear until after the fetus has sustained irreversible injury. Oral doses >/=10 mg of candesartan cilexetil/kg/day administered to pregnant rats during late gestation and continued through lactation were associated with reduced survival and an increased incidence of hydronephrosis in the offspring. The 10-mg/kg/day dose in rats is approximately 2.8 times the maximum recommended daily human dose (MRHD) of 32 mg on a mg/m 2 basis (comparison assumes human body weight of 50 kg). Candesartan cilexetil given to pregnant rabbits at an oral dose of 3 mg/kg/day (approximately 1.7 times the MRHD on a mg/m 2 basis) caused maternal toxicity (decreased body weight and death) but, in surviving dams, had no adverse effects on fetal survival, fetal weight, or external, visceral, or skeletal development. No maternal toxicity or adverse effects on fetal development were observed when oral doses up to 1000 mg of candesartan cilexetil/kg/day (approximately 138 times the MRHD on a mg/m 2 basis) were administered to pregnant mice. In patients with an activated renin-angiotensin system, such as volume- and/or salt-depleted patients (eg, those being treated with diuretics), symptomatic hypotension may occur. These conditions should be corrected prior to administration of ATACAND, or the treatment should start under close medical supervision (see DOSAGE AND ADMINISTRATION ). Caution should be observed when initiating therapy in patients with heart failure. Patients with heart failure given ATACAND commonly have some reduction in blood pressure. In patients with symptomatic hypotension this may require temporarily reducing the dose of ATACAND, or diuretic, or both, and volume repletion. In the CHARM program, hypotension was reported in 18.8% of patients on candesartan versus 9.8% of patients on placebo. The incidence of hypotension leading to drug discontinuation in candesartan-treated patients was 4.1% compared with 2.0% in placebo-treated patients. Monitoring of blood pressure is recommended during dose escalation and periodically thereafter. In studies of ACE inhibitors in patients with unilateral or bilateral renal artery stenosis, increases in serum creatinine or blood urea nitrogen (BUN) have been reported. There has been no long-term use of ATACAND in patients with unilateral or bilateral renal artery stenosis, but similar results may be expected. In heart failure patients treated with ATACAND, increases in serum creatinine may occur. Dosage reduction or discontinuation of the diuretic or ATACAND, and volume repletion may be required. In the CHARM program, the incidence of abnormal renal function (e.g., creatinine increase) was 12.5% in patients treated with candesartan versus 6.3% in patients treated with placebo. The incidence of abnormal renal function (eg, creatinine increase) leading to drug discontinuation in candesartan-treated patients was 6.3% compared with 2.9% in placebo-treated patients. Evaluation of patients with heart failure should always include assessment of renal function and volume status. Monitoring of serum creatinine is recommended during dose escalation and periodically thereafter. In heart failure patients treated with ATACAND, hyperkalemia may occur, especially when taken concomitantly with ACE inhibitors and potassium-sparing diuretics such as spironolactone. In the CHARM program, the incidence of hyperkalemia was 6.3% in patients treated with candesartan versus 2.1% in patients treated with placebo. The incidence of hyperkalemia leading to drug discontinuation in candesartan-treated patients was 2.4% compared with 0.6% in placebo-treated patients. During treatment with ATACAND in patients with heart failure, monitoring of serum potassium is recommended during dose escalation and periodically thereafter. Pregnancy-- Female patients of childbearing age should be told about the consequences of second- and third-trimester exposure to drugs that act on the renin-angiotensin system, and they should also be told that these consequences do not appear to have resulted from intrauterine drug exposure that has been limited to the first trimester. These patients should be asked to report pregnancies to their physicians as soon as possible. No significant drug interactions have been reported in studies of candesartan cilexetil given with other drugs such as glyburide, nifedipine, digoxin, warfarin, hydrochlorothiazide, and oral contraceptives in healthy volunteers, or given with enalapril to patients with heart failure (NYHA class II and III). 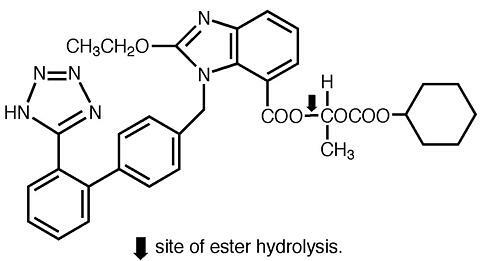 Because candesartan is not significantly metabolized by the cytochrome P450 system and at therapeutic concentrations has no effects on P450 enzymes, interactions with drugs that inhibit or are metabolized by those enzymes would not be expected. Lithium-- Reversible increases in serum lithium concentrations and toxicity have been reported during concomitant administration of lithium with ACE inhibitors, and with some angiotensin II receptor antagonists. An increase in serum lithium concentration has been reported during concomitant administration of lithium with ATACAND, so careful monitoring of serum lithium levels is recommended during concomitant use. Pregnancy Categories C (first trimester) and D (second and third trimesters)--See WARNINGS , Fetal/Neonatal Morbidity and Mortality . It is not known whether candesartan is excreted in human milk, but candesartan has been shown to be present in rat milk. Because of the potential for adverse effects on the nursing infant, a decision should be made whether to discontinue nursing or discontinue the drug, taking into account the importance of the drug to the mother. Of the total number of subjects in clinical studies of ATACAND, 21% (683/3260) were 65 and over, while 3% (87/3260) were 75 and over. No overall differences in safety or effectiveness were observed between these subjects and younger subjects, and other reported clinical experience has not identified differences in responses between the elderly and younger patients, but greater sensitivity of some older individuals cannot be ruled out. In a placebo-controlled trial of about 200 elderly hypertensive patients (ages 65 to 87 years), administration of candesartan cilexetil was well tolerated and lowered blood pressure by about 12/6 mm Hg more than placebo. Of the 7599 patients with heart failure in the CHARM program, 4343 (57%) were age 65 years or older and 1736 (23%) were 75 years or older. In patients >/=75 years of age, the incidence of drug discontinuations due to adverse events was higher for those treated with ATACAND or placebo compared with patients <75 years of age. In these patients, the most common adverse events leading to drug discontinuation at an incidence of at least 3%, and more frequent with ATACAND than placebo, were abnormal renal function (7.9% vs. 4.0%), hypotension (5.2% vs. 3.2%) and hyperkalemia (4.2% vs. 0.9%). In addition to monitoring of serum creatinine, potassium, and blood pressure during dose escalation and periodically thereafter, greater sensitivity of some older individuals with heart failure must be considered. The rate of withdrawals due to adverse events in all trials in patients (7510 total) was 3.3% (ie, 108 of 3260) of patients treated with candesartan cilexetil as monotherapy and 3.5% (ie, 39 of 1106) of patients treated with placebo. In placebo-controlled trials, discontinuation of therapy due to clinical adverse events occurred in 2.4% (ie, 57 of 2350) of patients treated with ATACAND and 3.4% (ie, 35 of 1027) of patients treated with placebo. The adverse events that occurred in placebo-controlled clinical trials in at least 1% of patients treated with ATACAND and at a higher incidence in candesartan cilexetil (n=2350) than placebo (n=1027) patients included back pain (3% vs. 2%), dizziness (4% vs. 3%), upper respiratory tract infection (6% vs. 4%), pharyngitis (2% vs. 1%), and rhinitis (2% vs. 1%). The following adverse events occurred in placebo-controlled clinical trials at a more than 1% rate but at about the same or greater incidence in patients receiving placebo compared to candesartan cilexetil: fatigue, peripheral edema, chest pain, headache, bronchitis, coughing, sinusitis, nausea, abdominal pain, diarrhea, vomiting, arthralgia, albuminuria. Other potentially important adverse events that have been reported, whether or not attributed to treatment, with an incidence of 0.5% or greater from the 3260 patients worldwide treated in clinical trials with ATACAND are listed below. It cannot be determined whether these events were causally related to ATACAND. Body as a Whole: asthenia, fever; Central and Peripheral Nervous System: paresthesia, vertigo; Gastrointestinal System Disorder: dyspepsia, gastroenteritis; Heart Rate and Rhythm Disorders: tachycardia, palpitation; Metabolic and Nutritional Disorders: creatine phosphokinase increased, hyperglycemia, hypertriglyceridemia, hyperuricemia; Musculoskeletal System Disorders: myalgia; Platelet/Bleeding-Clotting Disorders: epistaxis; Psychiatric Disorders: anxiety, depression, somnolence; Respiratory System Disorders: dyspnea; Skin and Appendages Disorders: rash, sweating increased; Urinary System Disorders: hematuria. Other reported events seen less frequently included angina pectoris, myocardial infarction, and angioedema. 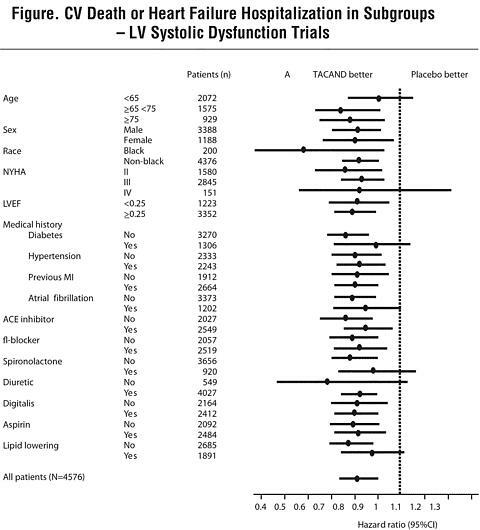 The adverse event profile of ATACAND in heart failure patients was consistent with the pharmacology of the drug and the health status of the patients. In the CHARM program, comparing ATACAND in total daily doses up to 32 mg once daily (n=3803) with placebo (n=3796), 21.0% of patients discontinued ATACAND for adverse events vs. 16.1% of placebo patients. In controlled clinical trials, clinically important changes in standard laboratory parameters were rarely associated with the administration of ATACAND. Creatinine, Blood Urea Nitrogen -- Minor increases in blood urea nitrogen (BUN) and serum creatinine were observed infrequently. Hyperuricemia -- Hyperuricemia was rarely found (19 or 0.6% of 3260 patients treated with candesartan cilexetil and 5 or 0.5% of 1106 patients treated with placebo). Hemoglobin and Hematocrit -- Small decreases in hemoglobin and hematocrit (mean decreases of approximately 0.2 grams/dL and 0.5 volume percent, respectively) were observed in patients treated with ATACAND alone but were rarely of clinical importance. Anemia, leukopenia, and thrombocytopenia were associated with withdrawal of one patient each from clinical trials. Potassium -- A small increase (mean increase of 0.1 mEq/L) was observed in patients treated with ATACAND alone but was rarely of clinical importance. One patient from a congestive heart failure trial was withdrawn for hyperkalemia (serum potassium = 7.5 mEq/L). This patient was also receiving spironolactone. Liver Function Tests -- Elevations of liver enzymes and/or serum bilirubin were observed infrequently. Five patients assigned to candesartan cilexetil in clinical trials were withdrawn because of abnormal liver chemistries. All had elevated transaminases. Two had mildly elevated total bilirubin, but one of these patients was diagnosed with Hepatitis A. In the CHARM program, small increases in serum creatinine (mean increase 0.2 mg/dL in candesartan-treated patients and 0.1 mg/dL in placebo-treated patients) and serum potassium (mean increase 0.15 mEq/L in candesartan-treated patients and 0.02 mEq/L in placebo-treated patients), and small decreases in hemoglobin (mean decrease 0.5 gm/dL in candesartan-treated patients and 0.3 gm/dL in placebo-treated patients) and hematocrit (mean decrease 1.6% in candesartan-treated patients and 0.9% in placebo-treated patients) were observed. Treatment: To obtain up-to-date information about the treatment of overdose, consult your Regional Poison Control Center. Telephone numbers of certified poison control centers are listed in the Physicians' Desk Reference (PDR) . In managing overdose, consider the possibilities of multiple-drug overdoses, drug-drug interactions, and altered pharmacokinetics in your patient. No initial dosage adjustment is necessary for elderly patients, for patients with mildly impaired renal function, or for patients with mildly impaired hepatic function (see CLINICAL PHARMACOLOGY , Special Populations ). In patients with moderate hepatic impairment, consideration should be given to initiation of ATACAND at a lower dose (See CLINICAL PHARMACOLOGY , Special Populations ). For patients with possible depletion of intravascular volume (eg, patients treated with diuretics, particularly those with impaired renal function), ATACAND should be initiated under close medical supervision and consideration should be given to administration of a lower dose (see WARNINGS , Hypotension in Volume- and Salt-Depleted Patients ). NDC 0186-0016-28 unit dose packages of 100. NDC 0186-0032-28 unit dose packages of 100.